Video clip synopsis – The story of Captain James Cook’s ill-fated final voyage to the Pacific is one of tragic cultural misunderstanding. Broadband MP4 cookhawaii_bb.mp4 (19.1MB), suitable for iPods and computer downloads. Captain Cook in Hawaii is an excerpt from the 4 x one-hour series _Captain Cook – Obsession and Discovery, produced in 2007. The story of Captain James Cook’s ill-fated final voyage to the Pacific is one of tragic cultural misunderstanding. 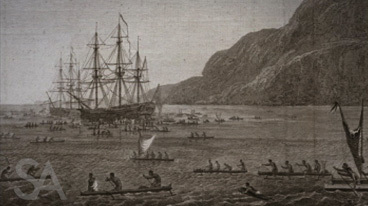 As told through the journals of Lieutenant James King and Captain Cook in A Voyage to the Pacific Ocean, printed in 1784, the explorers received a heroes’ welcome when Cook’s ship, Resolution, first landed in Hawaii’s Kealakekua Bay. The story of what unfolded over the next few weeks—as seen through the eyes of 18th century Englishmen—is revealed in numerous illustrations in the journals, including ‘A canoe of the Sandwich Islands, the rowers masked’, ‘A Masked Priest’ and ‘An offering before Capt. Cook in the Sandwich Islands’. But Cook’s welcome was short-lived once the islanders realised that the Resolution did not represent, as they first imagined, an earthly visitation of their god Orono—and this cost Cook his life in 1779. Why did Cook sail into Kealakekua Bay? With what event did his visit coincide? Why was that event important to the Hawaiians? What were the symbols associated with that event? How did Cook’s ship, and then Cook himself, seem to reflect or be consistent with the event? How did each side not have a cultural awareness of each other? How would that contribute to tension and conflict? Summarise in just one or two sentences why these journals and illustrations are ‘treasures’ in our knowledge and understanding of aspects of Australian history. Students should view the episode of National Treasures entitled “Captain Cook’s Tragic Death” to analyse the conclusion to this fateful encounter.